Work of the Poet: Obama Wins! Obama Wins! We're in tears! We'll be there for him! He'll be there for us! It's a happy and amazing time right now-I've told Trav and Mo that there are people in the streets here cheering. I want to go to sleep, but there's NO WAY I'm missing this acceptance speech. No. Way. He did it. And we did it! I'm definitely going to go celebrate with a "Black Russian!" Provided I can find my bottle of vodka, that is. Or, I suppose I can just toss a shot of that into a cup of coffee too, couldn't I? Anyway, thanks for stopping by my place and commenting. And thanks for being there with all the rest of us to be able to celebrate a change, and HOPE for the future again. Yay! I have hope for the future. Things are going to be better. Lovely photo. A good day for America. I thought his speech was wonderful. I am sorry also Mary, I hope you were right and I was wrong, time will tell. Yes we did and we have to continue the "yes we can". I'm still grinning from ear to ear and have shed many tears of joy and hope for our country. I've never felt more patriotic in my life and feel like anything is possible. God bless the U.S.A. and Congratulations America!! Woooohooooo ! ! ! I am SO HAPPY! thanks again mary, forgive and forget. God Bless America and our new President! It's a happy day for Americans, and I hope for the whole world. Let's hope it will prove to be the best thing for everybody - us included. Our new first family is all over all of my favorite blogs. Aren't they beautiful. I can't stop smiling everytime I see them in a new place. I'm trying to sleep this excitement off, but I just can't. America now --- it looks like a brighter future ahead. Wow, i really love this picture. It's so beautiful and full of love. There is alot of work ahead.. but now we have a very intelligent President... with a good heart.. there is hope. I live in a BLUE STATE now! There's a change a commin', and that change is good! What a lovely pic of the First Family! Barack Obama seems to be a brilliant, compassionate man. I hope the incredible task at hand for him is not too daunting; he has so much to take on immediately and on so many fronts. I also fear for his safety in his new position. Colin Powell talked about his hesitations about running for president as a black man. Let’s hope that the U.S. (North and South) are ready for this dynamic change…. some people are bound to be fighting this all the way. Don’t mean to be a downer, I just think there is so much at stake here. 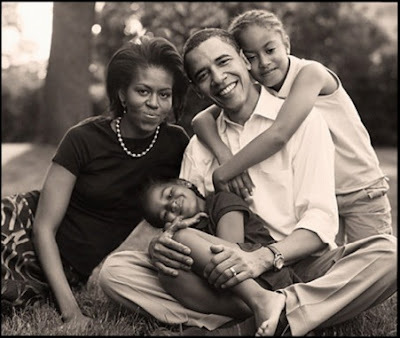 I hope it all works out for the best and that President Obama has a long and successful term(s) in the White House. It's a lovely portrait and sign of a bright future. Congratulations to your new president. What a great picture of our future First Family! What a beautiful photo of the first family! This is so thrilling. It hasn't sunk in yet; a decent, highly intelligent LEADER in the White House.